I was up at 5:30 this morning, had my quiet time, ate a light breakfast, and went 3 miles on the treadmill. I was told to quit doing 8 miles a day and cut back to 3 miles and to take Sundays off from the treadmill. Do you realize all the women that run my life. Our family doctor is retiring after 30 years of being our doctor and a lady doctor is taking his place. My nutritionist is a lady, my lung specialist was a lady, my secretary is a lady, my mail man is really a mail lady, I have an older sister, my wife, I have two daughters, a female poodle, and my 98 year old mother who all have their own ideas about what I should do! Ha! AGREE WITH THINE ADVERSARY! Peace at any price! I spoke this morning at the 9 am service on the PREPARATION FOR SOUL WINNING! Then I conducted a men’s session and spoke on LEADERSHIP! Dr. Mike Ray also spoke this morning and did a great job. He preached KEEP YOUR POLE IN THE WATER and tonight on THE BOWMAN. He did a great job! I always enjoy being with Dr. Ray. Tonight I preached WHY SHOULD YOU BE A PERSONAL SOUL WINNER? Before the invitation even began the altars were full. This is a great church! My host for this week was Patrick Hayes. He is one of the many men that Pastor Tom Barlament has led to Christ through his personal soul winning. 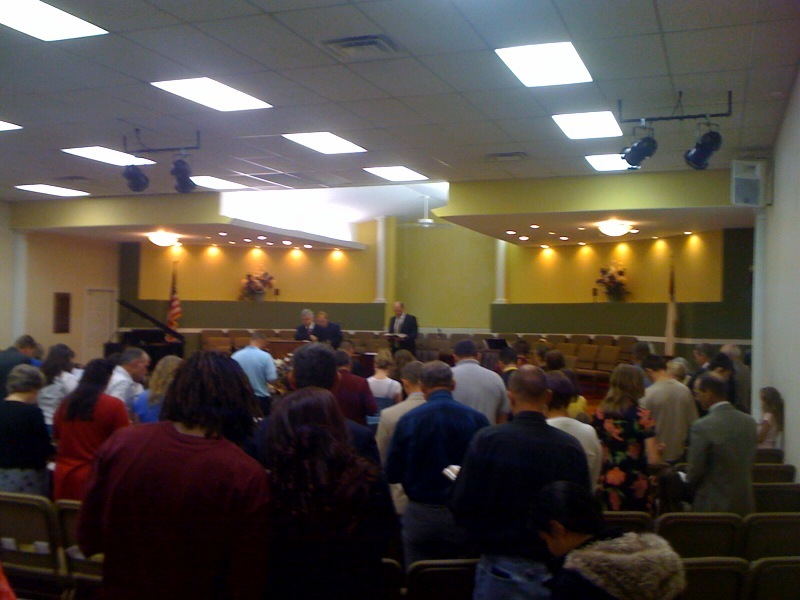 This is a church that has grown from a handful of people to running near 300 each week after nine years. He is entering his tenth year and I predict the greatest days are ahead for this dear man of God and his people! This has been a good week of soul winning for me. God has allowed me to lead 9 souls to Christ. I love it when pastors call me weeks later and tell me of those who follow the Lord in baptism that I had the privilege of leading to Christ. This past Sunday I had 2 follow the Lord in baptism in 2 different churches. GOTTA LOVE SOUL WINNING!